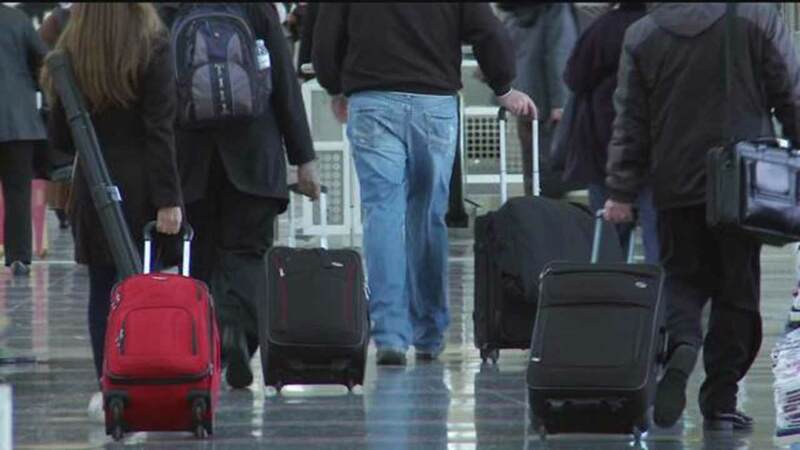 NEW YORK -- Millions of fliers might soon want to buy new carry-on suitcases. The recommendation by the International Air Transport Association suggests an "optimal" carry-on size at 21.5 inches tall by 13.5 inches wide by 7.5 inches deep. That's smaller than the current maximum size allowed by many airlines. For instance, American Airlines, Delta Air Lines and United Airlines all currently allow bags up to 22 inches by 14 inches by 9 inches - although gate agents don't always enforce those more-generous measurements. "Once again, the airlines find a way to make their problem the passenger's problem - and an expensive problem at that," said travel industry consultant Henry Harteveldt. The lack of overhead space is due to airlines cramming too many seats on planes and charging passengers to check their suitcases, he said. Airlines around the globe have varying standards - different enough that a carry-on bag that is acceptable to one airline isn't allowed in the cabin of another. The airline trade group says the new guideline will not necessarily replace each airline's rules on bag size, but gives them a uniform measurement that "will help iron out inconsistencies." Charlie Leocha, a consumer advocate and co-founder of Travelers United, said if enough airlines adopt these guidelines it will be great for travelers to at least know what size bag is acceptable on multiple airlines. However, Leocha measured his own carry-on bag Tuesday- one that he has traveled with for more than a decade and never struggled to fit into an overhead bin - to find out that it doesn't comply with the new suggested size. "Are the airlines are cahoots with the baggage manufactures? It just seems crazy," he said. Many bags already marketed as carry-on compliant actually aren't. For instance, for $56.99 Walmart sells the Rockland Luggage Sonic 20" ABS Spinner Carry On. The big is the right height and width but is one inch too deep for current U.S. airline rules. Macy's sells a Samsonite Silhouette Sphere bag for $460 that is marketed as meeting "carry-on requirements for most major airlines" but the bag is 15 inches wide, one inch too large. The airlines said they are working with several large luggage manufacturers including Samsonite, Delsey and Tumi but none have yet signed on. Bags with new labels, designating them as "Cabin OK," are expected to be in stores by the end of the year. Airline consultant Robert Mann said that if airlines did a better job of handling checked luggage, passengers wouldn't bring so many on the plane and fight for overhead bin space. Those $25 bag fees don't help either. "They literally create a disincentive to play their game," Mann said. In the end, Mann said airlines will do very little - regardless of bag size - to separate frequent business travelers who account for the bulk of their revenue from their suitcases.